In today's grab bag: a visit that rolls on, a visit that does not, and also Robocop. Felipe and Letizia had already headed out for the start of their first outgoing state visit to their neighbors in France when news of the tragic Germanwings plane crash broke. 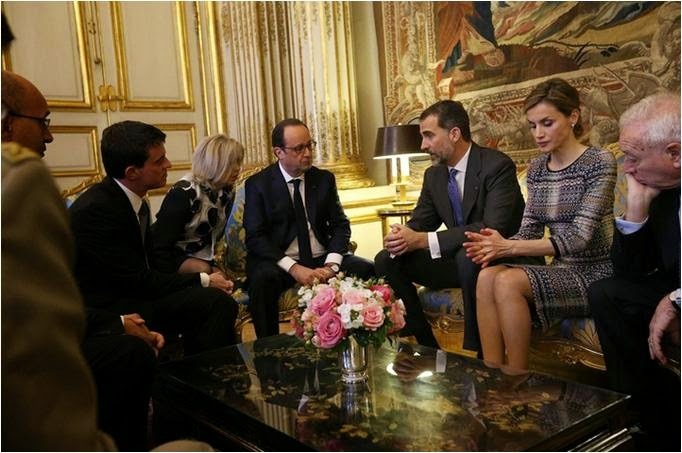 After landing, they jointly decided with President Hollande to cancel the state visit, and will reschedule in the future. They did spend the day in Paris and visited the crisis center for the crash. It was definitely the right thing to do, and since we won't be focusing on the French state visit as I had planned to do today, we'll proceed with other goings on. Elsewhere around the globe, Crown Princess Victoria and Prince Daniel embarked on day 2 of their visit to South Korea. She obviously had her outfits planned prior to the trip, but I did laugh when I saw that there wasn't any black and any possibility for see-through anywhere among them. Fool me once...etc. Engagements for the day included paying respects at the Seoul National Cemetery (above) and meeting the President (below). This is the Fadi El Khoury coat she wore to the royal wedding in Luxembourg in 2012, and I guess I'm still waiting for it to be styled in just the right way. Still a bit meh for me, though I can't deny she's looking pretty boss at the head of the dark suit crew there. She was also sporting a floral headpiece, flower earrings from Kreuger Jewellery, a blouse with a bow and a necklace with stars slung on top, and a repeated By Malene Birger skirt with lace panels. It's a lot going on, despite the similar color palette. She simplified things a bit for a meeting with the Prime Minister (above), and now we're talking. This is the Dolce & Gabbana dress she wore to Princess Leonore's christening (and which was worn by Princess Marie-Chantal as well), and it gets an A+ from me. And finally, we check in with Queen Robocop, who is still hobbling around doing her Mathilde thing (in this case, visiting RTBF studio last week with King Philippe). And with an updo, I bid you adieu.